Magnetic boards typically feature an extremely durable porcelain coating on a steel substrate. They stand up well to heavy daily use, resist scratching, clean well and allow you to use magnetic letters in your lessons or post papers using "refrigerator" magnets. Porcelain-on-steel boards cost more, but with guarantees of up to 50 years, they also tend to be your best value. Melamine boards typically feature a melamine writing surface on a hardboard substrate. The writing surface is clear coated, which is what makes the melamine erasable. Melamine boards are better suited to lighter use situations where the need to erase is less frequent (a cafeteria menu board, for example). Melamine markerboards are not magnetic. They tend to cost less than magnetic boards but don't stand up to heavy use as long, either. A typical warranty for a melamine board is five years. 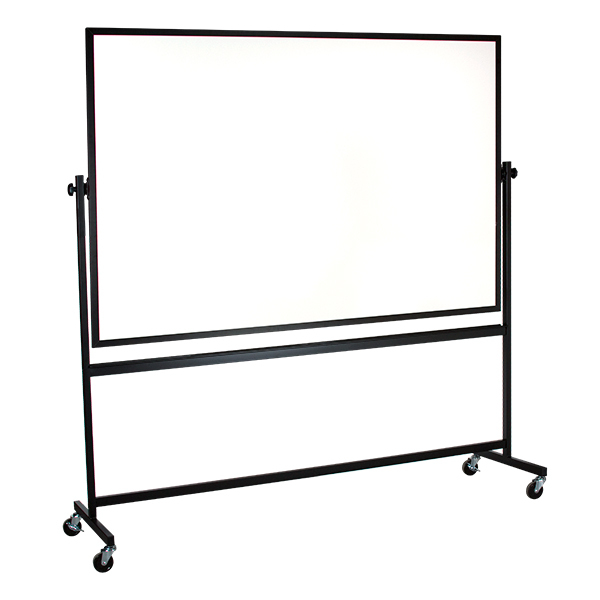 Classrooms typically have fixed dry erase boards mounted to the walls, but in situations where you need to move a board from room to room or from one place to another in a room, consider a mobile board. They're available with or without wheels, and most are reversible so they're doubly useful. Choose a two-sided markerboard, a makerboard/cork board combo, or a markerboard on one side with a chalk board on the other. Dry erase boards are not designed to be hung without a frame. Unframed boards can be retrofit into existing frames or placed in custom frames. Call us at 1-800-260-2776 and we'll be happy to help you determine the correct size and place your custom order. Framed boards are available in a variety of attractive wooden and metal frame styles. These are all made to hang easily. Depending on their size, shipping costs on boards vary widely. We encourage you to call us at 1-800-260-2776 to make certain you get the best possible rate. Proper care of your whiteboard is essential for long life. Magnetic boards need little special maintenance. Melamine boards, on the other hand, require a little more work. They should be carefully cleaned using approved solutions, and marker ink should not be left on the writing surface for long periods. Dirty erasers should be replaced. On either type of board, use only approved dry erase board pens and accessories. Never use permanent marker or other writing tools. If you accidentally write in permanent marker, a professional cleaning product may remove it. Writing over what you've written in dry erase marker will help "pick up" the permanent marker. Remember, even a quality melamine dry erase board will eventually "ghost" as the clear coating on its writing surface wears away. Ghosting is the marker image left on the board's surface after cleaning. To avoid ghosting, we recommend that you consider a magnetic, porcelain-on-steel board. If you have questions about which markerboard is right for you, please call us for help at 1-800-260-2776 for expert advice and personalized service. Or, check out our entire selection of dry erase boards.